Ladies and gentleman, we are still reviewing Action Comics #312! If you missed the first part of this segment, then go back and check out what you missed. Kav: OK the Planet staff go out on Perry's yacht for a secret meeting. They go out on the yacht to get away from Superman's prying eyes.....uh....guys? Superman can see a space gnat coughing in a distant solar system. 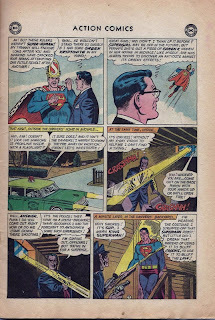 Superman states that he no longer patrols Metropolis for fear of being assassinated by kryptonite. Suggestion: since there's so much kryptonite on Earth, just give each resident a piece because Superman's reign would be short. 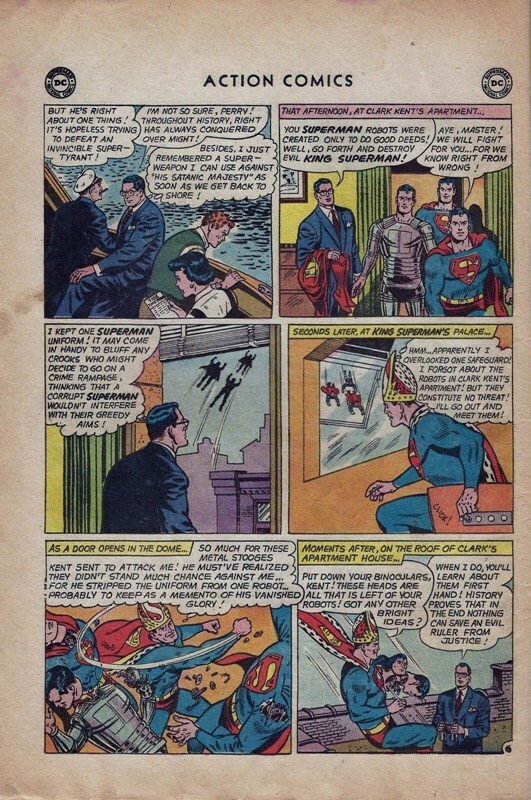 Tony: Clark complains in the first panel that the Superman symbol is a sign of tyranny. We know that evil Superman will be defeated, but why would Clark use the old symbol after evil Superman was defeated? I'm still dumbfounded that the Daily Planet staff decided that a meeting on a little yacht was a good idea. Why not meet on a battleship or why not meet in a bomb shelter? The brainpower of Perry, Jimmy, Clark, and Lois is at a negative level in my opinion. Since they are on a boat then you should have this song playing in your head. 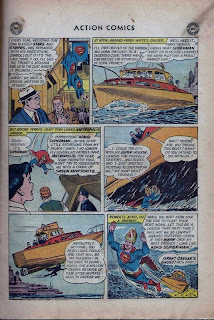 Finally, evil Superman leaves the yacht on a sandbar? Wow, that's not evil. An evil dude would have tossed them into a volcano. That's not how Omar rolls on The Wire. Kav: OK this page just pisses me off. The first thing evil Superman did, well, the second thing, after crushing Clark's 'hand' was easily polishing off the fortress robots. 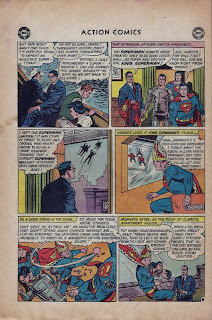 Why Clark thinks his apartment robots can defeat Superman now shows his lack of attention span. Tony: The robot idea would have worked had someone thought of giving each robot a piece of kyrptonite. You know what's smarter than sending in the robots? CALLING ON THE JUSTICE LEAGUE! Finally, we have a cool moment for the evil Superman where he pulls an Idi Amin on the robots. Kav: Clark thinks of a plan to go to Supergirl's house to search for some kryptonite but here's a better idea: go outside and look up. A piece of kryptonite seems to fall out of the sky whenever the plot requires it, Clark so you should know that by now. 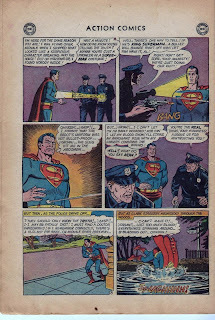 Then Clark gets cornered by the cops who tell him to come out then wait while he takes off his three piece suit and puts on the Superman costume. These are some patient cops, man. 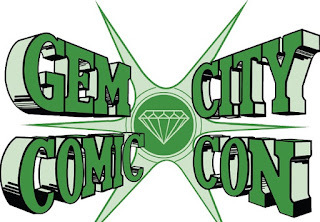 Tony: It's frustrating that the Golden and Silver Age comics always put heroes in a distant location. Supergirl is in the future? If she's in the future then she knows about the rule of the evil Superman. Maybe she could go back in time to fix the situation. Then again what do I know? Also, I love how Supergirl keeps some kryptonite in her basement. She does not keep it in a safe? This is MADNESS! Tony: This may be the most idiotic panel I have reviewed. Clark is shot in the abdomen and treats it as if he were punched in the gut. The man was shot in the abdomen at point blank range and does not even flinch. Even better, there is no bullet hole. What caliber bullet was used? Even if it was a .22, there would be blood. But no, not in this panel. I guess the idiot writer knew nothing about guns and gun shot wounds. 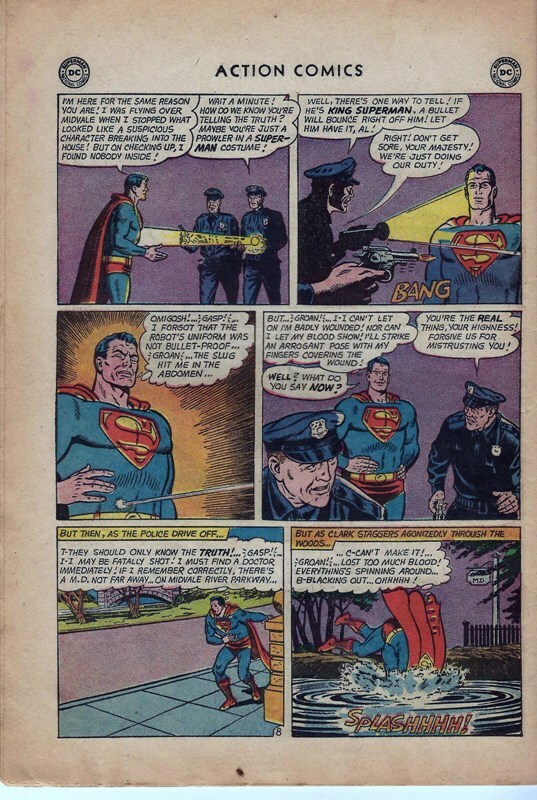 How on earth can Clark walk after being shot? THERE IS NO BLOOD! How is this possible? Have you seen Reservoir Dogs? Tim Roth's character, Mr. Orange, was swimming in a pool of blood after he was shot in the abdomen. Sit tight folks and wait for the rest of Action Comics #312 to be reviewed.